With 37% Diquat and formulated under strict quality control, Reward Herbicide outperforms generic formulations time-after-time! 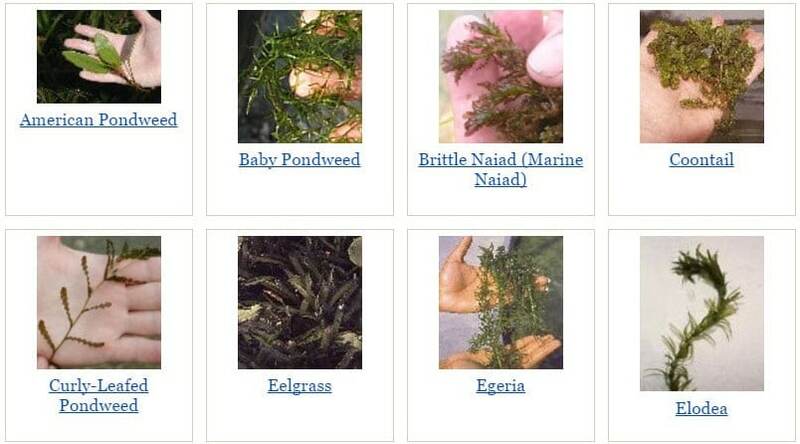 Reward herbicide is a Super-Fast acting weed killer, which works great on floating and submersed weeds, and makes a perfect rapid knockdown killer for Elodea, Eurasian Watermilfoil, Coontail and Duckweed and Algae. That’s why professional applicators recommend Reward Herbicide for severe aquatic weed control, or, for use along shoreline areas as a spot treatment. This 37% diquat based weed control product is absorbed by target plants in just minutes with no toxicity to fish or wildlife, and has No Swimming Restriction. Reward can be used along the edges and non-flooded areas of ponds, lakes, drainage ditches and canals. Once applied, Reward herbicide diffuses rapidly through the cuticle and then throughout the leaf tissue of the weed. The first effects can be seen within an hour. Complete control of floating vegetation occurs within one to five days, while submerged weeds require approximately five to 15 days for control. Absorption and herbicidal action is usually quite rapid with effects visible in a few days. Reward Landscape and Aquatic Herbicide controls weeds by interfering with photosynthesis within green plant tissue. Weed plants should be succulent and actively growing for best results. Powerful Reward Landscape and Aquatic Herbicide is a nonvolatile herbicidal chemical and makes a perfect general herbicide to control weeds in commercial greenhouses and nurseries; ornamental seed crops (flowers, bulbs, etc. – except in the state of California); landscape, industrial, recreational, commercial, residential, and public areas; turf renovation (all turf areas except commercial sod farms); dormant established turfgrass (bermudagrass, zoysiagrass – nonfood or feed crop); and aquatic areas. Weed plants should be succulent and actively growing for best results. Rinse all spray equipment thoroughly with water after use. Avoid spray drift to crops, ornamentals, and other desirable plants during application, as injury may result. I was not sure whether Reward would work or not on my milfoil infestation taking over my pond. But it really did a great job. I applied at the 2 gallons per acre rate along the shoreline and it killed the milfoil within 1 day. It started to look like it was dying within 1 hour of application. All-in-all I am very satisfied with this product and keep it handy as an all around knock-down killer whenever anything weird starts growing in the pond. I have been fighting severe duckweed and watermeal in our small lake for over 5 years and have tried every product under the sun to no avail. After spraying down the surface, the duckweed and watermeal started to die immediately and was completely gone in about 3 days. It does come back now and then so I usually have to retreat as needed. This is a very helpful weed control product that has allowed us to start enjoying our lake for a change. We bought our lakefront home so that we could relax and ‘get away’, but without Reward herbicide, that wasn’t happening. Thank you for a great product! Every two years my pond gets overtaken with watermeal. My routine is simple; Treat the entire pond with Sonar that I get from Newtechbio (best prices around). Then, once the watermeal is completely gone, I do what I call ‘shoreline patrol’. Meaning, whenever any weed gets carried in on the back of an animal or a bird, I mix a small amount of Reward with some dish soap and water, and spray the floating weeds. The birds have a tendancy to bring in watermeal and duckweed on their backs, but other things like turtles and snakes do the same. Awesome product. 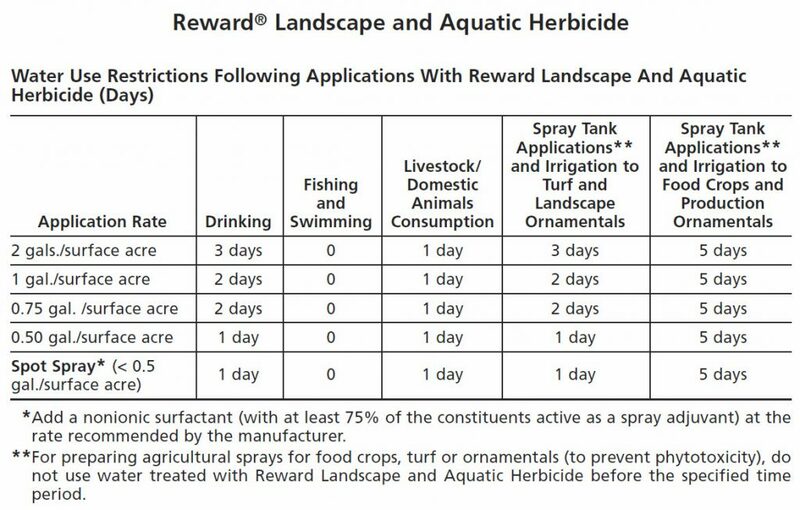 Application examples using Reward Herbicide: Sample 100ft x 100ft Lakeshore Lot (.23 Acre) * Amount of Reward required : .46 Gal for Submerged weeds. 4 ft average depth. Sample 148ft x 148ft Pond (.50 Acre) * Amount of Reward required: One Gal for Submerged weeds. Water Use Restrictions: None on Swimming or Fishing. Irrigation 5 Days. Container Size: 1 Gal Jug Formulation: Liquid *Consult Label for Exact Doses, Additional restrictions & Important Application Directions. From a few hours to a few days, but generally one week or less. Control is dependent on weed type and environmental conditions (sunlight, water temperature). Why doesn’t my applicator treat all areas at one time? If your problem area is small, one application is all that may be necessary. But if you have a larger weed problem, applications may be done in stages. This allows the weeds to decompose gradually without lowering oxygen levels needed by fish. Is Reward toxic to wildlife? Based on 45 years of data, the EPA has concluded that Reward poses no unreasonable risk to fish or other aquatic organisms. Why does the applicator wear protective gear if the product is not toxic? applied, it dilutes quickly, allowing for normal activity to resume. When can water be used after treatment with Reward? When used in accordance with label instructions, water is safe to use with minimal time restrictions depending on activity. See chart. Dose requirements are less for Duckweed control or shallow waters of less than 2 Feet. 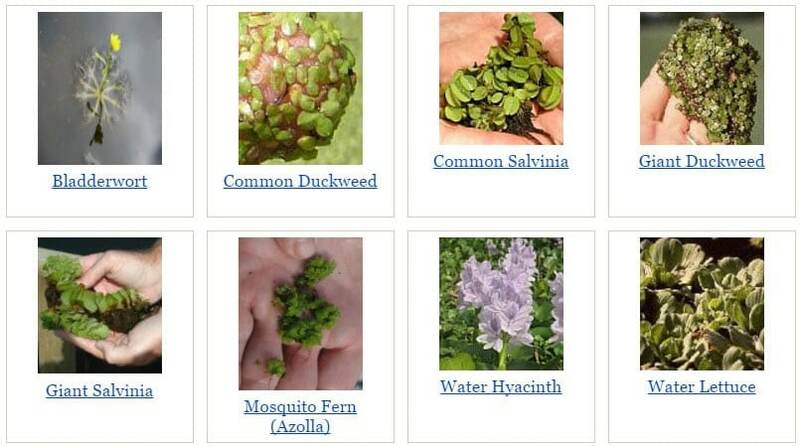 For Duckweed control the label recommends adding a non-ionic surfactant. One pint of DyneAmic Surfactant is typically enough for most projects. (See DyneAmic Surfactant) Shipping: Reward cannot ship to all states. 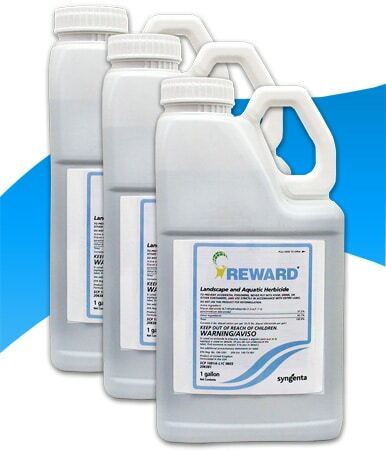 Important: The Reward label recommends a surfactant when used for Duckweed control. Order DyneAmic Surfactant when ordering Reward. It may be feasible to tank-mix Reward Herbicide with additional herbicides and/or algaecides for enhanced control such as Clipper Herbicide, Sonar Genesis or other Fluridone based products.